Mentioned is the way you can write Airline Refunds Manager CV Template . 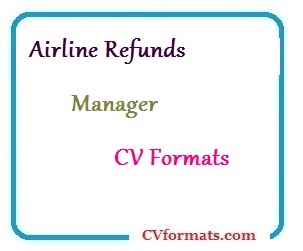 People looking for jobs can easily download these Airline Refunds Manager CV formats in editable pdf and MS-Word (.doc) formats or you can just copy and paste from or website CV Formats.com and app. Cover letter of Airline Refunds Manager CV Template is also available. Just change the name , address , qualification and experience and your Airline Refunds Manager CV Template is ready. Ensure compliance of all refund requests with airline policies and procedures. Reject refund requests for non refundable tickets unless approved by airline executives for purely marketing purposes. Approve refund deposits customer accounts or prepare refund checks. 2010: Attended Air Transport Course conducted by the USA-CAA.